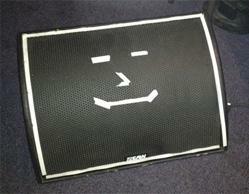 The other day I was reading an article on ProSoundWeb.com about mixing stage monitors from the Front of House console. The article pertained to church sound but, could also be used for standard mixing in bars, clubs, and other venues. The process involves using a stage monitor speaker as a "cue wedge" so that you can hear each monitor mix at the FOH mix location. This is a great idea for every sound tech that mixes monitors from the front of house console. To figure out the hookup for this setup at the Front of House mix console, I consult a couple of professional sound techs for some tips. Both guys gave me ways to achieve the setup. Thanks guys! The way you setup the cue wedge monitors will vary with each different mix console. The basics of the setup is to allow you to take a feed from a solo buss for the console and patch it into a power amplifier plus stage monitor speaker. So, then you would solo the monitor mix and send the feed to the local power amp/speaker setup. This would be similar to the idea of using the PFL solo button on each channel to send a feed to a pair of headphones. I am hoping to try out the cue wedge setup on my next gig and see how it works. Of course, it will mean that I will have get the extra power amp and speaker setup and cabling for the setup. I will post the results in a later enty. Click on the following link for the article on the ProSoundWeb.com website.